The HP Envy 4520's quick setup time and sleek design are enticing, but its print and scanning performance make it a poor investment. The HP Envy 4520 is a sleek and simple all-in-one color inkjet printer that manages to pack in a collection of features in a compact size. From its almost invisible scanner and copier to its integrated touchscreen, HP hits on all of the important bits of a compact all-in-one solution and does so at a reasonable price point, but during our testing performance and print quality simply didn’t measure up to the competition. The first thing we noticed about the HP Envy 4520 is its slim, minimal design. It takes design cues from HP's other all-in-one printers but shrinks down the size while keeping most of the same functionality. The copier and scanner lid blends in almost seamlessly to the top of the printer and the decision to remove all but one physical button in favor of a touchscreen and digital buttons make for a clean appearance that would hold its own in the most minimal of apartments or dorm rooms. Setting up the HP Envy 4520 is as straightforward as it gets. Out of the box, the only thing that needs to be plugged in is the standard power cord. Once the power supply is plugged in, it's simply a matter of removing some of the tape HP uses to secure the various components and to load in the two ink cartridges provided inside the box. In our experience, the two ink cartridges went in without any hassle and were immediately recognized by the printer. Setting up the HP Envy 4520 is as straightforward as it gets. On the computer side of things, it didn't prove much more difficult. If using the built-in Wi-Fi connectivity, it’s simply a matter of navigating to the networking menu on the printer, choosing the correct hotspot, and entering the password if applicable. One interesting thing we noticed is that the password for the Wi-Fi network has to be entered using a phone-style keyboard, where the letters are divided up into sets of three and need to be rotated through. It makes sense considering a full-size keyboard would be a bit cramped on the small touchscreen display, but it did catch us off-guard. If using a wired connection, just plug the printer into the computer and install the proper software, be it with the included disk or directly from HP's software page. The print quality from the HP Envy 4520 hovers somewhere on the lower side of average. When we tested it with a variety of font sizes on standard printer paper, the printer struggled with smaller fonts. The ink was dry straight out of the printer and there wasn't any smudging that we could see, but anything smaller than 12-point font showed up very uneven on paper. The edges of the letters were very splotchy. Smaller fonts and italics particularly proved to be a challenge. Basic graphics and charts looked good, but anything more than a simple image highlighted the weakness of the two cartridge design (one black, one Tri-color (cyan, magenta, yellow)). Photographs, even ones with very basic compositions and colors, struggle to yield acceptable results, despite being printed on proper photo paper. Yes, the printer can print borderless 4x6-inch prints, but skin tones are rendered inaccurately and basic gradients between colors have visible banding. We also noticed that our first few photo prints had very clear banding from one side to the other. This persisted until the printer had some time to warm up. Even then, it was still possible to see the banding if viewed closely enough. In terms of printer speeds, our testing showed HP's 6.8 pages per minute for fine quality color prints and 20 pages per minute for black and white draft prints were fairly accurate, give or take a page depending on what was being printed. The built-in paper tray holds up to 100 sheets of standard printer paper and the output tray, which cleverly slides out when needed, can hold roughly 25 pages before the paper starts to spill all over the place. One feature we appreciated was the built-in quiet mode. Rather than waking up the kid in the next room over or interrupting a meeting, the HP Envy 4520 uses its integrated quiet mode to discreetly print out page after page, albeit at a slower pace and quality. Similar to the printing ability of the HP Envy 4520, the text and basic document scanning were less than ideal. Smaller fonts rendered soft and even basic graphics on a page produced subpar results, regardless of what file format was used (the HP Envy 4520 supports TIFF, JPEG, PNG, BMP, and PDF formats when scanning). When it came to photos, the scanner also proved to be lackluster. Colors were skewed, the blacks appeared faded, and detail in any highlights was lost. HP's included scanner software made it possible to remedy a few of the issues, such as dialing the blacks back in, but it wasn't a fix-all. Simply put, this all-in-one is more than good enough for archiving of documents and the digitization of basic receipts and notes, but don't purchase this with the intention of digitizing family photos at high quality. HP has been in the printer game for quite some time and it shows in its impressive software. Whether it's downloaded online or installed straight from the disc provided in the box, the software is simple to install and fairly straightforward to use. HP also has an accompanying smartphone app that makes it easy to check ink levels, change settings, control copying/scanning, and print both photos and documents from mobile devices. The built-in Wi-Fi 802.11b/g/n made wireless printing fast and reliable, whether it was done via direct wireless printing, HP ePrint, or Apple AirPrint. Even larger images were sent to the printer in a matter of seconds and documents were almost instantaneous. The onboard USB 2.0 port also proved speedy with zero noticeable lag, but we would’ve liked to see a built-in Ethernet port and the option to print media directly from USB drives and memory cards. The HP Envy 4520 has hovered around the $100 mark for quite some time, as of this writing you can get it for $99.98 MSRP. At first glance, the price tag appears to match the adequate features and sleek design of the HP Envy 4520, but as with all printers, the price of the printer itself isn't the one that matters so much—it's the ink. Every time the ink cartridges run dry on the HP Envy 4520, which is approximately 190 pages for the black ink and 165 pages for the color ink, a new set will cost you somewhere in the realm of $45, give or take a bit. That averages out to somewhere between eight and twelve cents a page, depending on the paper used and the mixture of ink being used in individual prints. HP does offer high-yield ink cartridges, but even those don't make much of a dent in the per-page cost in the long-run. So, while the printer itself might seem like a bargain, especially if acquired on sale or used, it will still cost a fair bit in the long run. 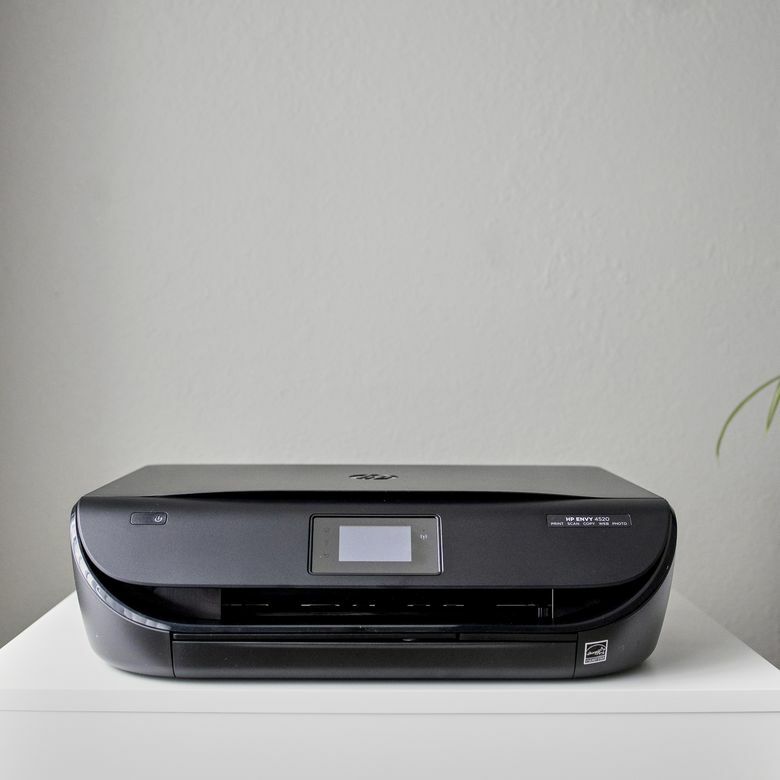 The HP Envy 4520 competes in a rather crowded market of budget all-in-one printers. Its contemporaries include the Canon Pixma MG6820 ($130), Epson Workforce Pro WF-3720 ($85), and Brother MFC-J460DW ($75). The Brother MFC-J460DW is on par, if not slightly below the HP Envy 4520 in a number of key areas, but both the Canon Pixma MG6820 and Epson Workforce Pro WF-3720 are compelling options that offer better print quality and more features They might not be as sleek and minimal as the HP Envy 4520, but dollar for dollar, they're hard to beat, especially when taking into account the price of ink over the life of the printer. Want to take a look at other option? Read through our list of the best photo printers on the market now. Beauty doesn't translate to features. All in all, the HP Envy 4520 leaves much to be desired. While it's a looker on the outside, it's lackluster under the hood and isn't easy on the wallet when printing a lot of documents or photos. If you're looking for an affordable photo printer, you're far better off spending an extra hundred dollars or so on a dedicated photo printer like Canon's PIXMA iP8720 or Epson's Expression Photo XP-8500, which retail for $180 and $200. Product Dimensions 14.45 x 17.52 x 5.04 in.